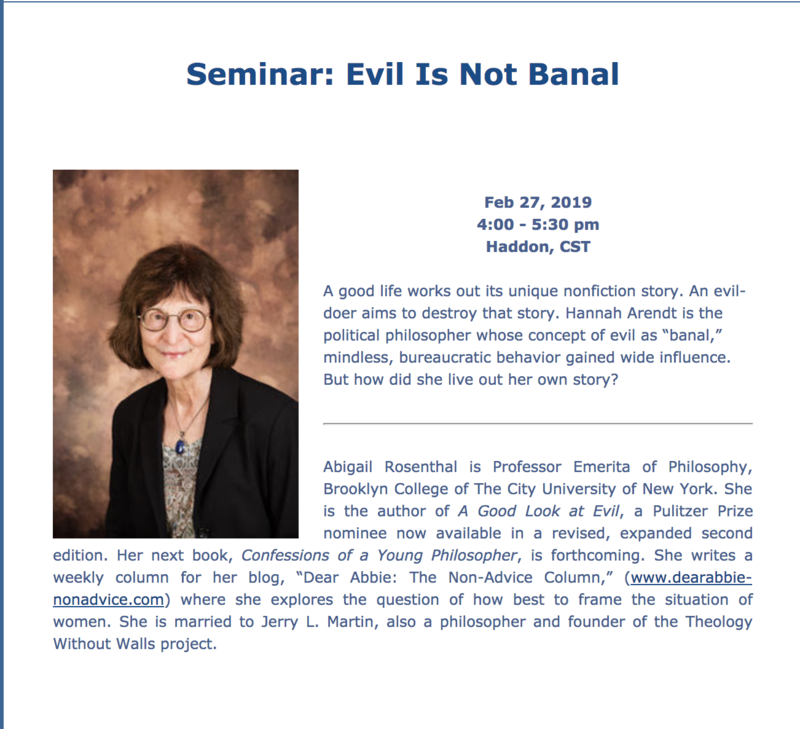 “Evil is Really Not Banal” | "Dear Abbie: The Non-Advice Column"
There are two younger theologians who normally organize these events. As it happened, one was on leave. The other was home recovering from minor eye surgery and simultaneously tending to a gas leak. We had a total of five in the audience. Was I rattled? Well no. I was focused on the business of the afternoon, which was explaining what evil is and is not. But of course I did notice. There’s a back story to my noticing. From the moment of its appearance in February 2018, A Good Look at Evil has encountered an astonishing array of obstacles. For example: it was published with the wrong pub date; the earlier edition was posted on Amazon in place of the expanded new edition; at one time the earlier preface was placed in the new edition instead of the new preface; customer reviews of the new edition were placed next to the earlier edition, and – there’s more, but I hope you get the idea. Of course, all this while I was coping with a fractured knee. Despite all of that, from the start the book has drawn attentive, serious and extremely favorable endorsements and reviews from highly regarded people you can’t buy for love or money. But the feature of its publication that’s been noticed by me was the appearance of a character in my real life who paralleled the character of The Seducer portrayed in my book in the section called “The Rake’s Progress”! Was this a coincidence? After all, real life is filled with coincidences — events that seem to have a meaning but are merely the effect of chance. But on the other hand: if we were to take the imaginative leap of picturing “evil” as a person, having personal intentions, wouldn’t such a person do his or her damnedest to test the ability of a writer to fight the real thing in a real-life setting, rather than just combat it with words on paper? Was “evil” trying to find out if I really meant what I wrote? Of course I don’t know … but I couldn’t help noticing. Anyway, back to my talk at Claremont. To my relief, I experienced no inward qualms about reading my paper to a small but – as it turned out – highly focused and intelligent group. The aim of my paper was to show that it took conscious evil to bring about the Holocaust. The perpetrators of the Holocaust were not mere bureaucrats acting by rote. Hannah Arendt, who popularized this fiction, had been complicit in a kind of moral cover-up for reasons of her own. Her reasons have come to light in the years since her vastly influential book, Eichmann in Jerusalem: A Report on the Banality of Evil, was first published. When, from time to time, I stopped reading and gave illustrations from real life, the audience seemed to “get it.” So, no problem. Time for Q & A. There were several intelligent and responsive questions – prompts for further thought about these hard topics. Then a quiet, decorous gentleman, who had a certain modest but elegant bearing, raised his hand. It was not to ask a question. It was to explain, “objectively,” as he said, that Jews had brought the Holocaust on themselves. Nevertheless, to hear it in an academic Q & A was a new experience for me. I’d read about this stuff. I’d never actually met it shorn of its usual disguises. I looked at Jerry, seated in the front row. He was, as he told me later, wondering what I would say. I was wondering too. “I DENOUNCE YOU FROM FLOOR TO CEILING. OF ANY OF THESE POINTS. Despite a few further attempts from the decorous gentleman to reassert his views and his topics, the Q & A got firmly removed from that terrain. The remainder of the discussion was fruitful and interesting. So what was happening here? If “evil” – pictured by imaginative leap as a person — wanted to entrap me in its coils, how better to entice an academic than to draw her into hopeless counter-argument with someone who came to her talk for the sole purpose of excusing the Holocaust with a mindset lethally immune to argument? This entry was posted in "Absolute Freedom and Terror", Absurdism, Academe, Action, Alienation, American Politics, Art of Living, Atheism, Autonomy, Biblical God, books, bureaucracy, Christianity, Cities, Class, conformism, Contemplation, Contradictions, Cool, Courage, cults, Cultural Politics, Culture, dialectic, Ethics, Evil, Existentialism, exploitation, Faith, Fashion, Femininity, Feminism, Freedom, Friendship, glitterati, Guilt and Innocence, Hegel, hegemony, Heroes, hidden God, History, history of ideas, Idealism, Ideality, Identity, Ideology, Idolatry, Immorality, Institutional Power, Jews, Journalism, Judaism, Law, Legal Responsibility, life and death struggle, Literature, Martyrdom, Memoir, memory, Mind Control, Modernism, Moral action, Moral evaluation, Moral psychology, morality, Mortality, Oppression, Past and Future, Peace, Philosophy, Political, Political Movements, politics, politics of ideas, post modernism, Power, presence, promissory notes, Propaganda, Psychology, public facade, Public Intellectual, Race, radicalism, Reading, Reductionism, relationships, Religion, Roles, secular, Seduction, self-deception, social construction, Social Conventions, social ranking, spiritual journey, spiritual not religious, Spirituality, status, status of women, Suffering, Terror, terrorism, The Examined Life, The Problematic of Men, The Problematic of Woman, the profane, the sacred, Theism, Theology, Time, twentieth century, twenty-first century, victimhood, victims, Violence, War, Work, Writing, Zeitgeist and tagged Abigail L. Rosenthal's "A Good Look at Evil", audience Q&A, author/publisher relation, “The Rake’s Progress”, banality of evil, behaviorism, Bernard Harrison’s Blaming the Jews: The Persistence of a Delusion, blaming the Jews, book endorsements, book reviewers, book reviews, bureaucratic mindset, Claremont School of Theology, Coincidences, conscious evil, diabolical cunning, Evil, evil personified, excusing the Holocaust, explaining evil, fiction and real life, fighting the good fight, firming resolve, futile counterargument, groupthink, guidance from above, Hannah Arendt, Hannah Arendt's Eichmann in Jerusalem: A Report on the Banality of Evil, Holocaust research, illustrations from life, knee fracture, Loma Linda Hospital, meaning what you say, moral coverup, Nazi arguments, Nazi canards, Nazi materials, Nazi talking points, neuropathy treatments, publishing snafus, speaker event, synchronicities, the Holocaust, the seducer, theologians, traps of argument, truth stranger than fiction, white-washing evil, wolf in sheep’s clothing. Bookmark the permalink. I was there … to hear something of great interest to me, and I was well-rewarded … excellent lecture by a gifted scholar/writer … who offered the profound reply noted above to the “decorous” gentlemen. His input was the equivalent of fingernails on a chalkboard, and Dr. Rosenthal’s reply was firmly and forthrightly given … it felt like a pronouncement from on high, and it might well have been. Tom, your presence in that hall was most appreciated. And it’s all the more heartening to see your corroboration of my report here in this forum. A gesture of timely spiritual friendship! So proud of you, Abigail! I’m so distressed with what is going on in Congress this week with the anti Semitic Muslim congresswoman and the Democratic leadership so far refusing to censure. Thank you so much, Prudence. What you say means a lot to me! Dear Madame Academic: Jaw-dropping while reading “the real thing happening in a real life setting”. Good ”noticing”! Perhaps too distressing to hear the Divine Chuckle in the midst of the on-the-ground battle. Also, I applaud your ability to get back to the Q&A with the others after the decorous gentleman’s chllenge. My heart would have been bouncing around like a ping-pong ball, making the mind a useless mess. Judy my dear. As you can imagine, I think I’ve never said anything remotely like that in my life. Frankly, I don’t believe those words were coming from me, if you know what I’m saying. I find ‘blaming the victim’ in the case of the Holocaust monstrous. I commend your forceful reaction. What is going on inside these people’s heads to want to excuse Hitler and his many henchmen (and -women)? Thanks so much, Johan. Each of your sentences rings a bell of its own.